Ski Tip Ranch Condos are one of the few townhome style condos located along the Snake River in Keystone Real Estate. Constructed between 1995 – 1997 there are a total of 50 Ski Tip Ranch Condos comprised of 11 – 2 bedrooms, 26 – 3 bedrooms and 13 – 4 bedroom properties. Located less than a mile from the Keystone Ski Resort and River Run for all your shopping and dining needs the location is private yet accessable as it is also on the bus route. Most Ski Tip Ranch Condos have private hot tubs on their decks or patios. If you are looking for additional amenities Ski Tip Ranch Condos have access to the Dakota pool, hot tubs, exercise room, sauna and steam room located in River Run. 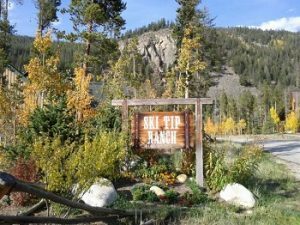 Ski Tip Ranch Condos are also located within steps of the historic Ski Tip Lodge where there is limited seating and the menu changes daily. Ski Tip Ranch Condos are a must see if you are looking for townhome style living in and condos for sale in Keystone CO Real Estate.